This summer we have had an awful lot of rain, which is always rather disappointing because we get such few months of nice weather in Upstate New York that we all tend to eagerly anticipate July and August all year round! To maintain the status quo, Thursday morning was an absolute wash! We awoke to drizzle, which Milt and I don't mind too much if we are wearing the proper attire (rain jacket for me and fur coat for Milt! ), but about 10 minutes into our walk, we were pummeled by a massive downpour. Prior to leaving, I had noticed the severe thunderstorm warning on the television, but my goldendoodle was in need of his walk before the day got too busy, so we took a gamble, and we lost. 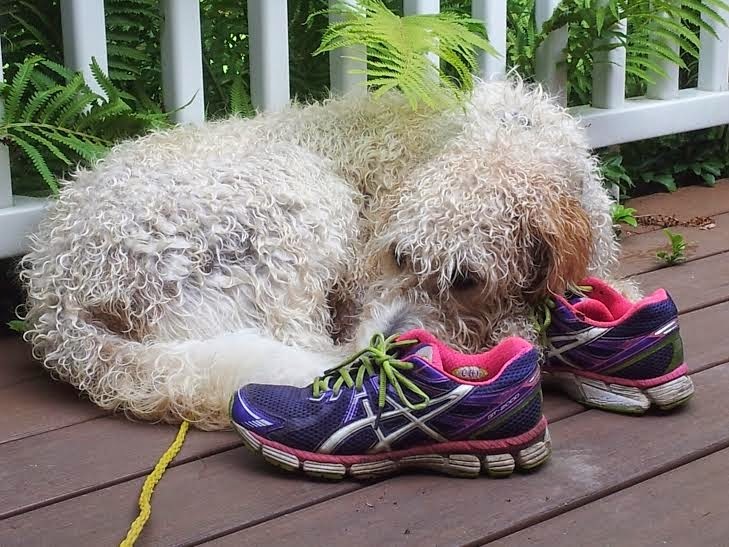 The lightning frightened Milt, and I arrived home with sodden sneakers that took two solid days to dry out. The point of this story -- Good Momma Dogs walk their little darlings despite the rain, but they quickly become bad Momma Dogs when lightning strikes a bit too close for comfort. Poor Milton. But how did he react? Did he pull you home, or did he want to climb into your lap? I know some dogs are quite skittish. Was Milton?